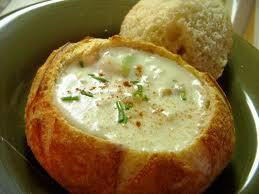 New England style clam chowder. If your’e craving a extra carbs, fill a crusty loaf of sour dough. In a pot, melt the butter, rosemary, thyme and combine with the milk. Stir, then add the clams and celery and salt. Bring to a light boil and continue to stir and reduce to a simmer. Serve in a hollowed out round loaf of warm and crusty sour dough bread or simply in a bowl. Garnish with a sprinkling of parsley.